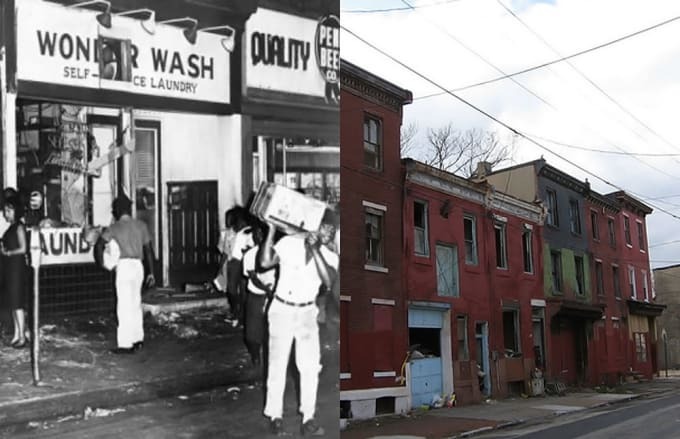 North Philadelphia was home to the majority of the city's black residents during the mid-1960s, and tensions between the community and Philadelphia police had been bubbling for quite some time over ugly cases of police brutality. The entire nation was captured by the spirit of revolution during the summer of 1964, and although the weather was hot, the country was still on thin ice. The ice in Philly finally cracked during the dog days of August when Odessa Bradford got into an argument with two police officers at 23rd Street & Columbia Avenue. When officers tried to remove her from her stalled vehicle, a crowd gathered and one man tried to help Bradford by attacking the police. Both he and Bradford were arrested, and a rumor spread that a pregnant black woman had been beaten to death by police. This ignited a riot in North Philly, where furious mobs burned and raided mostly white-owned businesses along Columbia Avenue. Because they were outnumbered, police withdrew from the area. Although no lives were lost, over 300 people were injured, nearly 800 were arrested, and upwards of 200 stores were damaged from August 28th to August 30th. The riot was devastating to businesses in North Philly, as many of the damaged stores never re-opened. In 1987, Columbia Avenue from Front to 33rd Streets was renamed Cecil B. Moore Avenue in honor of the local civil rights activist. Though his role was minor, Moore has been credited with helping to quell the riot. Some parts of the area have recovered from the riot, and if you travel South on Cecil B. Moore Avenue, you'll find that it's populated mostly by Temple University students.